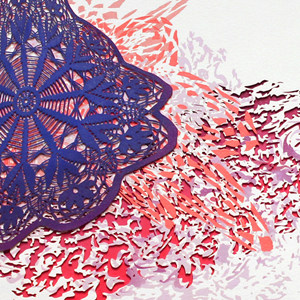 My recent work combines hand-cut paper and oil paint in a process that is highly meticulous and meditative. I began experimenting with papercutting several years ago after being inspired by my cultural heritage and the traditional Polish cut-paper folk art known as wycinanki. More recently, I have become fascinated by the disparity between the histories of oil painting and domestic craft, and my studio practice has evolved into an investigation of the potential merging of these two methodologies. By physically combining paint and hand-cut paper, I seek to reconcile their contextual differences while continuing the feminist tradition of elevating craft to the status of high art.